Put-in-Bay is a famous destination for large group outings. The island has been hosting bachelor and bachelorette parties, work retreats and family reunions for decades. Put-in-Bay also hosts recreational sports events like soccer and volleyball tournaments where entire teams come to compete and have fun. Getting your whole group under one roof makes these getaways so much more fun. Take a look at these home and condo vacation rentals to minimize your expenses and maximize your fun! Put-in-Bay Island Club Rentals is the preferred rental home company for Put-in-Bay Ohio. MAKE A RESERVATION! Visitors come to our vacation rentals every summer and enjoy the island life that is the hallmark of South Bass Island. You won’t believe you are in Ohio and may have visions of sitting in Key West, FL. Enjoy all the comforts of home while you experience everything that Put-in-Bay has to offer. CHECK ONLINE AVAILABILITY! Or call us at 216-898-9951 for a personalized experience with one of our specially-trained reservation agents. 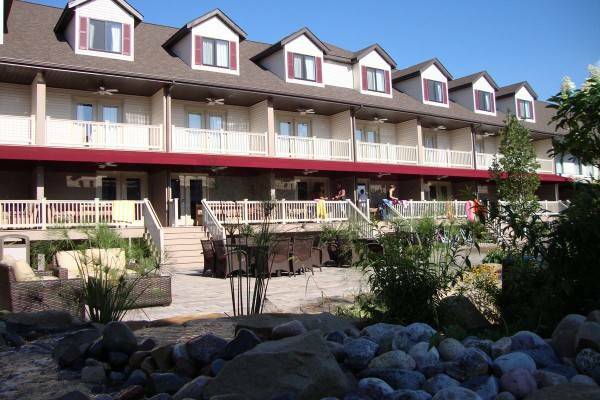 The Put-in-Bay Poolview Condos have the cozy lodging and ideal location for your group. CHECK AVAILABILITY! 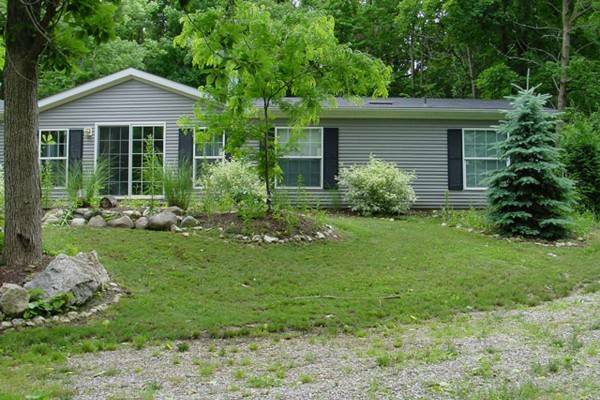 This property is adjacent to the Put-in-Bay Waterfront Condos. 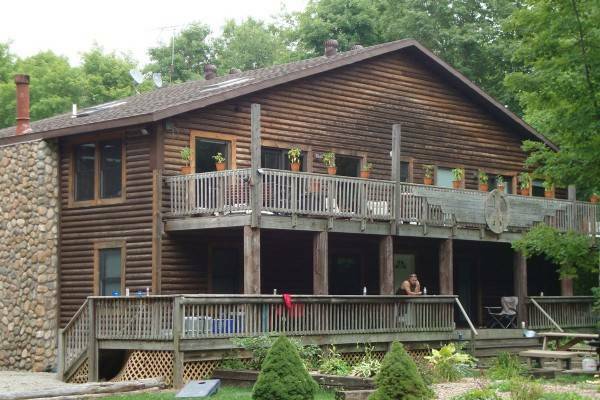 The highlight of this property is the fact that is located right on the lakeshore of Lake Erie. So, stay near the lake while on the island. Seems like a smart choice! A Place at the Bay is a private Put-in-Bay lodging option for up to 12 guests. CHECK AVAILABILITY! Renting a Put In Bay Cabin is perfect for a group. The outdoor area of the home is flanked by a lovely wooded area, setting a cozy atmosphere. Additionally, the rear of the property abuts Saunders Golf Course. This Put in Bay vacation home is located on Jeris Lane, across the street from the Island Club. The Put-in-Bay Villas are located adjacent to the Put-in-Bay Resort. Each villa rivals the best lodging found in Key West and other island vacation hot spots. Put-in-Bay Villas has sold out every weekend during the season since they opened. So, we recommend making your reservations now! Peace and Quiet is a lovely vacation rental on Put-in-Bay. BOOK ONLINE QUICKLY! Here, guests can enjoy there own piece of the island. 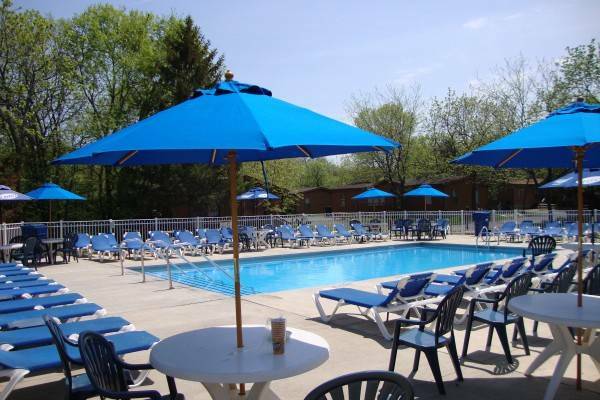 The lovely wooded lot is the perfect setting for an enjoyable stay. A fantastic location like Put-in-Bay can make a vacation great, but in the end, the only thing that can make a vacation perfect is the people you spend it with. What good are memories if you don’t make them with people you care about? So if you’re coming to Put-in-Bay to make memories with people you care about, why not get them under one roof? Why not share breakfast with everybody in the kitchen of your lodging, and have a great family room to crash in and watch some TV after a long day of enjoying all that Put-in-Bay has to offer? That’s where Put-in-Bay vacation rentals come in. The Island Club has been welcoming guests to their vacation rentals for around 30 years now, and their experience shines through every time someone rents with them. 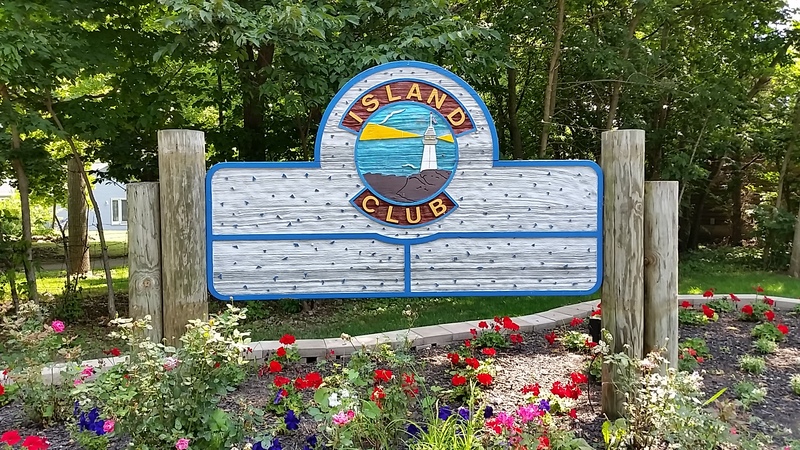 The Island Club is legendary at Put-in-Bay, playing host to thousands of bachelor and bachelorette parties, family reunions, fishing excursions and just plain-old vacation getaways. Bed, bath, kitchen, every Island Club rental is a full home with everything that comes with that, like washer/dryer and a grill! Every guest gets access to the famous Island Club pool too! They’ve done it all so they know it all, and they’ll make sure you and your group are well taken care of! Get a golf cart too! 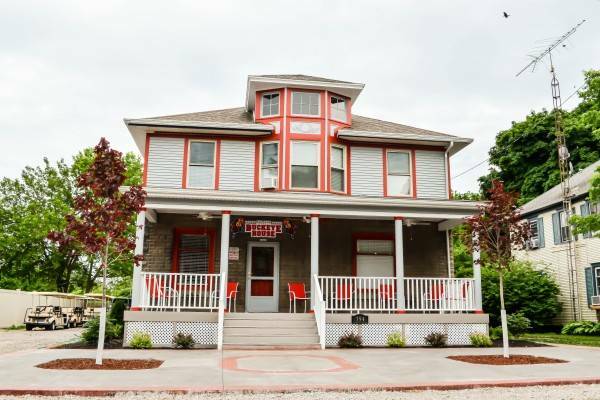 The Put-in-Bay Villas offer the convenience of the vacation rental, with the location of a downtown hotel area. Your group can enjoy a patio to sit out and enjoy people watching, with views of the Put-in-Bay Resort and Conference Center, as well as the Blue Marlin Tiki Bar. Or, if you prefer, you can just go there! 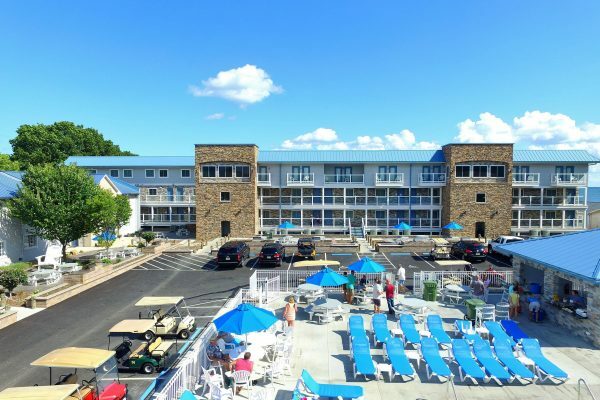 Blue Marlin has a swim-up bar that always brings the party, and a pool bar is an essential part of the Put-in-Bay experience that every person who comes to the island should see. 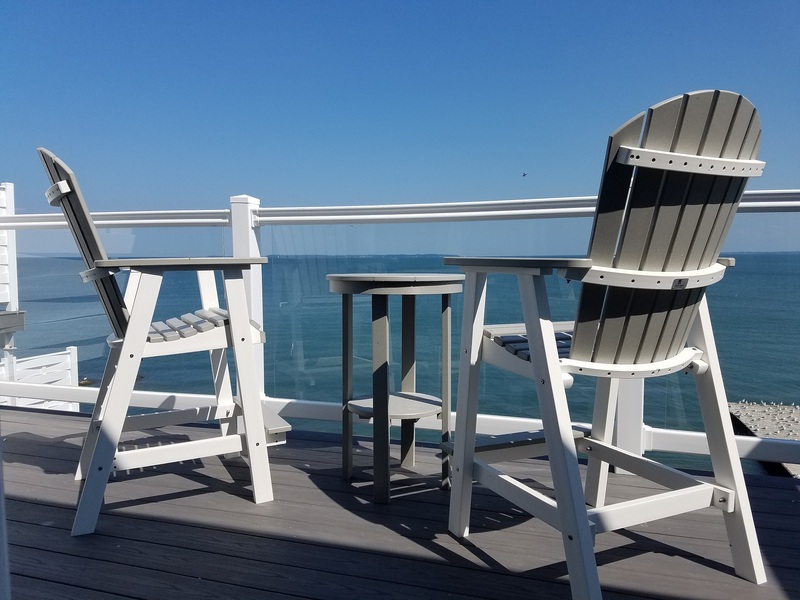 The newest lodging at Put-in-Bay also has the best views of Lake Erie that you’ll find anywhere, not just on the island, but in Ohio! 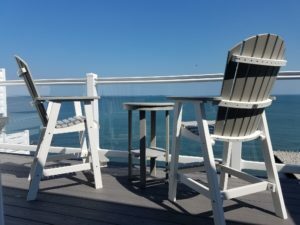 They’re called the Put-in-Bay Waterfront Condos and each unit has its own individual balcony with furniture to sit and enjoy the waves rolling onto the shore from Lake Erie. 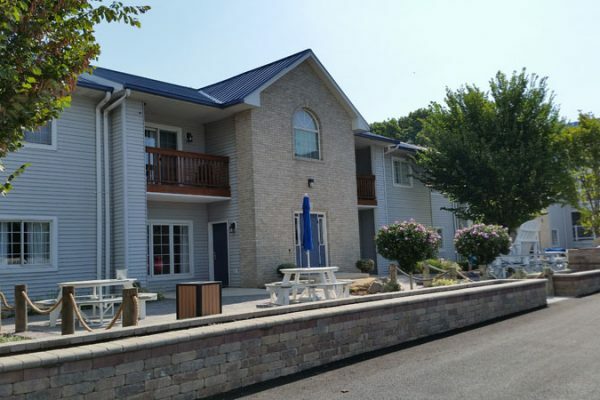 These condos were built just a couple years ago, and are immaculately maintained to provide a luxury experience that other Put-in-Bay lodging can’t match. In the event of a bachelorette party, or a family reunion, it’s hard enough to plan a vacation for a large group without having to worry about splitting everybody up between hotel rooms. Hotel rooms also don’t have kitchens, so every meal will have to be eaten at a restaurant, and that will get expensive. You can save some money on your vacation by cooking some meals in your fully equipped kitchen in these vacation rentals. And you can eat those meals surrounded by everyone in your group, making memories that will last a lifetime at Put-in-Bay. So hop onto a Put-in-Bay ferry to South Bass Island and check out a Put-in-Bay condo rental for a weekend, a vacation that every person in your group can enjoy together!